The Irish hare (Lepus timidus hibernicus) is one of three lagomorphs found on the Island of Ireland and the only native lagomorph. Of the other two lagomorph species, brown hares occur in Northern Ireland and rabbits are widespread. The Irish hare is thought to have been present from the late Pleistocene. Fossil remains have been recovered from numerous sites throughout the country including Shandon and Ballinamintra caves, Co. Waterford, the Coffey and Plunkett caves, Co. Sligo and in the Catacombs, Alice and Gwendoline, Newhall and Barntick caves in Co. Clare. Irish hare are much larger than rabbits, females tending to be a little larger than males (adults weigh between 3–3.6kg). Females hence dominate males throughout the year. During the breeding season hares seen ‘boxing’ are likely to be a female boxing a male. The coat of the Irish hare can be quite variable but generally it is russet brown. However, much darker and lighter individuals have also been recorded. Unlike other mountain hares the Irish hare very rarely moult to white in the winter. Nevertheless, hares with large areas of white, sometimes piebald in appearance have been observed. The tail is always white as is the underbelly. While the ears are long they are shorter than the length of the head (while in brown hares ears are longer than the head). During the winter moult ears can be fringed with white fur. Maximum lifespan is thought to be in the range of nine years though mortality is highest among juveniles. Hares are found throughout the world in a wide range of habitats. The Irish hare belongs to the species mountain hare Lepus timidus of which there are at least sixteen subspecies, the Irish hare being endemic to Ireland. Lepus timidus is widespread ranging from 75ºN (north Russia and Scandinavia) southwards to 40–50ºN. In Europe, Lepus timidus is found in Scotland, northern England, Scandinavia and in the European Alps. The Irish hare is widespread throughout the country and is found in habitats as far ranging as coastal dunes to mountain tops. Densities however appear to fluctuate from year to year and often from habitat to habitat. Irish hares do not use dens but will make forms in sheltered locations. Forms are shallow depressions, often in dense vegetation such as rushes, heather, tall grass and even marram grass, and occasionally in hedgerows. Forms can also be used on bare peat or soil (for example in ploughed fields). The forms provide good concealment and often the hare is only seen when it is ‘flushed’ from its form moments before it is likely to be trodden on. Forms have also been shown to reduce exposure to wind. In open habitats, forms are usually situated to afford good views of the surrounding habitat. Female Irish hares have been recorded breeding in nearly every month of the year. However, peak breeding probably occurs during spring and summer. Each female may produce two to three litters per year. The litter sizes range from one to four. Gestation period is about 50 days. Unlike rabbits, leverets (baby hares) are born above ground. They are fully furred and have their eyes open. They will hide in thick vegetation. In order to protect them from being detected by predators their mother will only feed the leverets once a day usually around dusk. The litter stays together for the first few days but then disperse to the surrounding area. The young hares grow rapidly and are weaned by about 21 days. Juvenile mortality is high though with only one out of every five leverets surviving their first year. Diet of the Irish hare varies between habitat and seasonally. It is composed mainly of grasses, but heather particularly Calluna vulgaris and sedges can be an important food source in habitats where they are available. Irish hares will consume a wide variety of plant species and in one study 26 different species were recorded. Browse species, such as Birch Betula spp., and Sallow Salix spp., are probably taken more in the winter months, particularly during periods of snow cover. A survey of Irish hares was carried out in 2006 and 2007 for the National Parks and Wildlife Service. 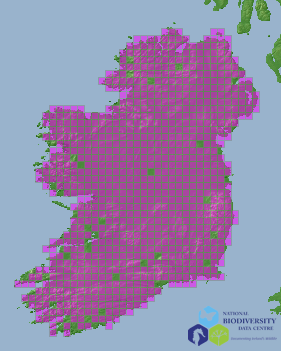 The survey suggests an estimated density of 7.66 hares/km2 (95% CI 4.83-14.29) in the Republic of Ireland. However, densities of hares are known to vary widely from habitat to habitat (1-127 hares/km2). As with hare populations in other part of the world, the Irish hare, has the capacity for short-term population change, both increases and decreases. These changes are likely to be influenced by numerous factors including leveret survival rates. Leveret survival in turn is influenced by weather conditions, availability of good forage and levels of predation. In the above survey, total estimated abundance for the Republic of Ireland was 233,000 hares in 2006 to 535,000 in 2007. The Irish hare is legally protected since 1930 in the Republic of Ireland, initially under the Game Preservation Act (1930), then by the Wildlife Act (1976) and Wildlife (Amendment) Act 2000. It is listed on Appendix III of the Berne Convention, Annex V(a) of the EC Habitats Directive (92/43/EEC) and as an internationally important species in the Irish Red Data Book. However, it is also classified as a game or quarry species and may be hunted under licence during the open season. Under licence hares are captured for coursing. Recent studies suggest that the levels of genetic diversity of hares within Ireland could suggest that the Irish hare may warrant full species status. Dr Karina Dingerkus is an ecologist with seventeen years experience of working with local authorities, charities, academic institutions and as a self employed consultant. In 2005, Karina returned to her native Mayo and set up Giorria Environmental Services, an ecological consultancy, with her husband Dr Richard Stone. In 1993, she completed a degree in Zoology from Aberdeen University and this was followed four years later with a PhD on ‘The Ecology and Distribution of the Irish hare in Northern Ireland’ at Queen’s University in Belfast. Reid, N., Dingerkus, K., Montgomery, W.I., Marnell, F., Jeffrey, R., Lynn, D., Kingston, N. & McDonald, R.A. (2007) Status of hares in Ireland. Irish Wildlife Manuals, 30. National Parks and Wildlife Service, Department of Environment, Heritage and Local Government. Dingerkus, S.K. & Montgomery, W.I. (2002) A review of the status and decline of the Irish hare Lepus timidus hibernicus in Northern Ireland. Mammal Review 32, 1-11. Dingerkus, S.K. & Montgomery, W.I. (2001) The diet and landclass affinities of the Irish hare Lepus timidus hibernicus. Journal of Zoology 253, 233-240. Dingerkus, S.K. & Montgomery, W.I. (1997) The distribution of the Irish hare Lepus timidus hibernicus in Northern Ireland and its relationship to land classification. Gibier Faune Sauvage 14, 325-334. Nature and Wildlife in Roscommon—Action for Biodiversity, Giorria Environmental Services and Janice Fuller, Roscommon County Council (2012). Biodiversity and Climate Change Resource Pack for Irish Girl Guides (2009). Contributed to the section on the Irish hare for the 4th edition of the Mammals of the British Isles (2008). Editors Harris, S. & Yalden, D.W. The Mammal Society. Southampton. West Galway Hedgerow Survey for Galway County Council (2007). Identifying feature:Large rabbit-like mammal with white tail and short ears. Number of young:1-3 born mainly in spring and summer but can be found all year. Habitat:Found in a wide range of habitats from coastal to mountain top, including upland and lowland bogs and farmland.